Last year I styled one room in three different Christmas schemes to demonstrate how one space can feel unique to your decorating preferences by switching up your accessories. I thought these three looks would be perfect for my Three Ways series, so let's get to it! First up is a Technicolour Christmas, for which I styled the space in a bright, primary colour palette with festive reds, blues, pinks and greens mixed in alongside shimmering garlands that I hung with abandon from the walls. It's a fun and playful scheme perfect for family homes. The second scheme, Whimsical Woodland, details rustic, textured details with lots of bare wood, knitted ornaments and organic elements such as pine cones and twigs. This look is full of tactile elements; a juxtaposition of rough and smooth surfaces. 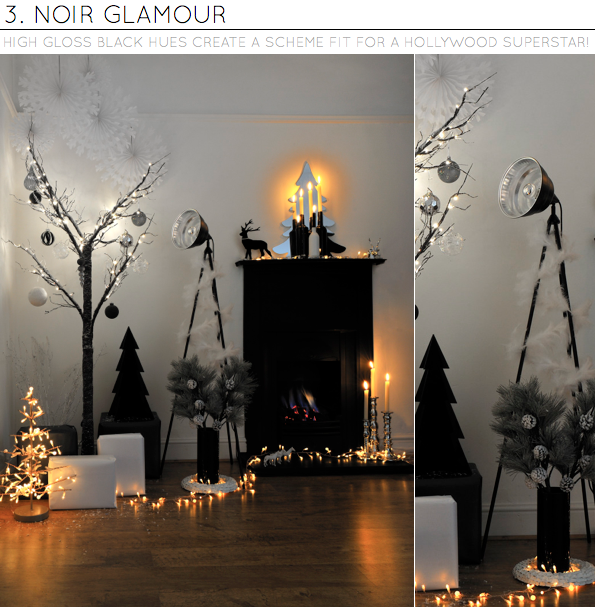 The third look, Noir Glamour, is a modern monochrome take on Christmas decorating. High gloss black hues, a collection of paper snowflakes and a photographic standard lamp help create a dramatic feel to the space - perfect for any Hollywood superstars amongst us! Which scheme do you like best? This one is so tough! I like them all...i'm digging noir glamour...but the kid in me is partial to that technicolour goodness! So hard to pick just one because they are all super. OK, my fave is the Technicolour Brights, love it! Love the Whimsical Woodland one. What fun to set up three versions of fun festive decor. 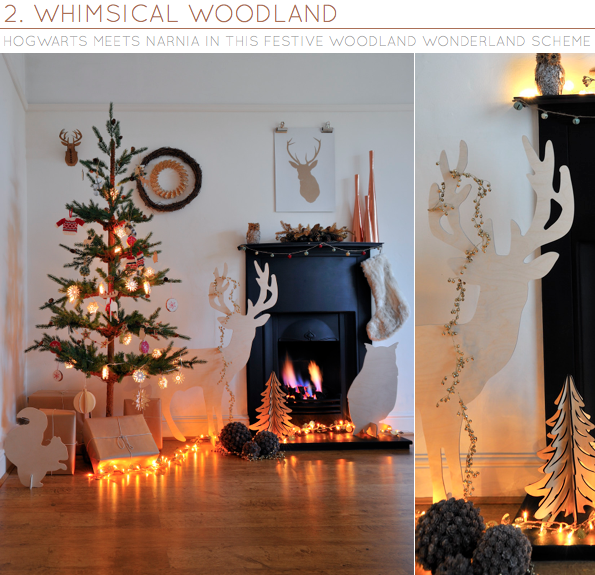 Whimsical Woodland gets my vote! stunning! 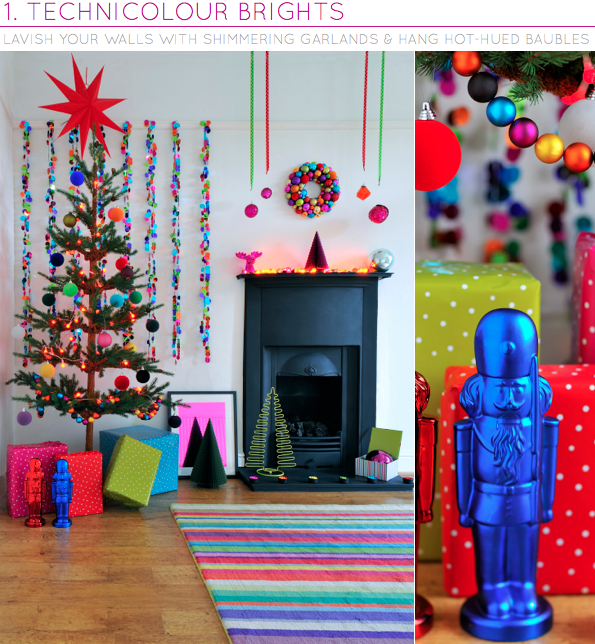 I really like the technicolour brights- I love the gardlands on the wall- an update of paper chains! Also, I really don't think the word festoon is used enough! These are so fun! I definitely would go for the whimsical woodland - those deer heads remind me of the deer we had always walking around our property. I think whimsical woodland is my favorite, although that blue nutcracker soldier is very cute! I love the bright colours in the first image -- and in so many images that you style and post, there is that sort of 'technicolour brights' look. I totally love it, and yet I am having a hard time imagining how to construct it myself. I have noticed that as long as yellow and pink are in the mix, it hits the spot (like the fluffy white xmas tree you posted the other day with pink and yellow ornaments). Then other colours can be added as well, in the context of a lot of white. Are there other tips or guidelines you can give in the creation of this kind of look? I think I'm somewhere in between technicolor brights and whimsical woodland! Olá! Adoro cores também!! !As suas postagens são divinas!! they're gorgeous! I can't make decision between the glamour and the whimsical. I guess I'd keep the glamour with more color..
Well the technicolour bright is definitely my favourite! Love the second one (you said the magic word- Hogwarts..) but I wouldn't say no to the black scheme. Great work Will! not sure which I love the most... ummm, all three? I actually love that deer. I'm loving this new Bazaar tradition. I've gotta go Whimsical! LOVE Whimsical Woodland!! They are all so nicely done. OMG!!! The colorfull one is beautiful, I love it. never saw a thing like this,, it just opened my eyes.